Opportunities to learn and grow abound! Thursday night Bible Institute classes are going strong, with 10 students in the Bible Doctrines class. After a Sunday service, a young man approached James, indicating he would like to learn how to witness more effectively. So, a few of the teen boys are going to start evangelism training every Thursday morning! One of the most exciting times of the week is early Sunday morning discipleship classes. James is taking the men through a discipleship workbook, and Amy is teaching the ladies an inductive Bible study on the book of Philippians. Our goal is not only to equip the believers for their own spiritual growth, but also for them “to teach others also.” As we ultimately “work our way out of a job” at this church plant, we want to see the church continue to thrive by reproducing themselves. What a joy to see folks saved and follow the Lord in steps of obedience! Victor and Rosa each trusted the Lord and then shortly later were convicted about their need to get married. They wanted to marry in the church so that all their friends and family would come and hear the Gospel, which they did! A few weeks later, three of those wedding guests each trusted Christ! “For learning to take place with any kind of efficiency students must be motivated. To be motivated, they must become interested. For the first time in the history of our church, we offered a Bible college-level class for the benefit of every one age 12 and up. Dr. Fred Moritz (Baptist World Mission Executive Director Emeritus) taught four days (10 hours) on theology of prayer and one day (2.5 hours) on theology of worship. We are thrilled to report that the average attendance of the class was 32, over two-thirds of whom were from our church and the remaining were visitors from the community or from other Baptist churches. The class was extremely well received and we believe it will have a lasting impact on the lives of the believers for years to come. Judy Moritz ministered to the ladies at a ladies’ meeting on Saturday afternoon. She also helped prepare and serve food every night of the class as well as supervise the children during class time. We are so thankful for the sacrifice of Dr. and Mrs. Moritz to come down to Argentina to minister in Pilar. Their ministry to us personally was priceless to this missionary family! The encouragement, godly counsel, and wisdom we gleaned from this remarkable couple was invaluable and particularly timely. Stateside: We wrapped up a short furlough in February with basically a zero net support gain, maintaining approximately a 91% support average. We held 23 meetings in those 20 weeks, 4 of which were for new support. Evangelism: We held special evangelistic meetings throughout the year for the church’s one year anniversary, a sacred music concert, monthly ladies’ meetings, monthly youth meetings, and our first missions conference. For evangelism training, we taught the Netcasters course on Wednesday nights. Several folks have made salvation decisions in these meetings and on visitation. Everyone who shows interest receives follow-up by either the pastor or a church member, but only a handful have shown lasting fruit so far. Discipleship: Our discipleship program continues to be the church’s primary strength. We held two semesters of Sunday discipleship and Saturday youth discipleship as well as 10 weeks of one-on-one with various new believers. The church body has faced several difficulties from within and without. Praise God for wisdom and patience in dealing with these situations. Training Nationals: There are three men in James’ Thursday night deacons’ training. 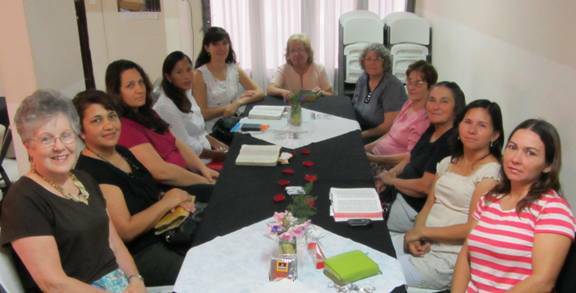 They have studied three leadership books and have been involved in visitation and new believers’ discipleship. The church will vote on the deacon candidates in January. We are still praying for a pastoral candidate. Church Building: In September we began a second service to accommodate for growth. Between the two services, the church is averaging 85 in attendance. The Argentines have given almost 50% of the total $20,000 raised for the purchase of property. We continue to search for land in the city center and are also talking with the owners of our current location about the possibility of buying. · Continue to raise funds for the purchase of church property. · Wisdom and funds to purchase church property – our rental contract expires in June! The Lord has brought us two new families recently and they both want to join the church! They are both from Pentecostal church backgrounds, but like the many others in our congregation, came to the realization that the Pentecostal preaching and practice does not line up with what God’s Word teaches. They were eager to get involved in some kind of discipleship. For the benefit and maximum growth of all, we’ve implemented a gradual, systematic discipleship program. · Step 1 – Basics for Believers – 10 lessons covering topics like salvation, baptism, and daily devotions. This is usually taught in the person’s home, by us or another member. 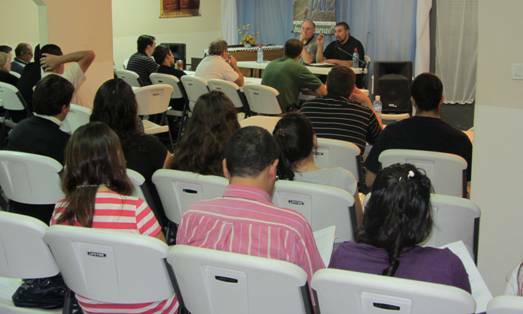 · Step 2 – New Members’ Class – 6 weeks of Baptist distinctives, taught by the Pastor. · Step 3 – Advanced Discipleship – 12-13 week, semester-based studies on Sundays, required for anyone who desires to serve in the church. This is taught on Sunday’s (like a Sunday School hour) by us or another member. · Step 4 – become a small group leader – whether adults, teens, or children. We visited both of these families and gave them the Basics for Believers booklet to start studying. We’ll set up a time to meet with them weekly to go through the book with them. This is a great way to get to know each other as well! On the mission field, you really can’t take anything for granted. People grow up with no Christian teaching or training. Those from other church backgrounds have been confused by conflicting faith and practice. Systematic discipleship is so vital for a healthy church body!